French radical left leader Jean-Luc Melenchon has called for a mutiny by Socialist Party ministers disenchanted with the policies of President Francois Hollande. Melenchon, a former Socialist minister who left the party and stood against Hollande as a candidate of the radical Left Front in the presidential elections this year, said ministers who opposed Hollande’s policies should come out of the closet. ‘You exist by being independent, not by being carried along by someone else,’ he said. ‘We need you to come and help us in our battle. MEP Melenchon garnered just over 11% of the vote in the first round of the presidential elections in April and his supporters helped Hollande defeat outgoing right-winger Nicolas Sarkozy in the second round. He has been absent from national politics since losing a head-to-head battle with far right leader Marine Le Pen for a seat in parliament in June. But Melenchon has once again grabbed the political limelight this week in a flurry of media appearances that come just as the President has completed 100 days in power. Melenchon’s radical left coalition, the Socialists and much of the country applauded early moves to introduce bold tax hikes on the rich. But timidness over an escalating manufacturing jobs crisis at home and agreements reached at series of EU summits ostensibly designed to tackle the Eurozone’s debt and banking crisis has meant Hollande now stands accused of back-tracking on key election promises. Notably he’s seen to have dropped pledges to ditch his predecessor’s austerity medicine and instead promote jobs and growth, which have been pretty much ditched by his decision to sign up to EU deficit-reduction targets that will force the government to slash public spending and further damage the country’s already stagnant economy. Having in his election campaign opposed the EU fiscal pact – which ties governments to economically lethal deficit-cutting plans – Hollande is now signed up to it. He was dreading opening a debate – or even potentially a referendum – that will revive memories of his failed campaign (opposed by large sections of the Socialist Party) for a “Yes” vote in the 2005 national popular vote on a European constitution. Luckily for the President earlier this month France’s Constitutional Council ruled that no change to the country’s constitution was necessary to adopt the EU’s fiscal pact. This means no requirement for a two thirds majority, but just a simple majority. The Socialists and Green allies have a majority in both houses of parliament. Melenchon and allies continue to demand a referendum so such a fundamental curtailment of parliament’s sovereignty to set budgets can at least enjoy the democratic backing of the French people, if that is the popular will. .
‘If you are so sure of your treaty, why not ask thé views of the people?’ said Melenchon, addressing the President on air. ‘After a comedy of negotiation [with Germany] it was a sellout. Should we accept the “Merkozy” treaty? Lose the remaining room for manoeuvre left in the country? 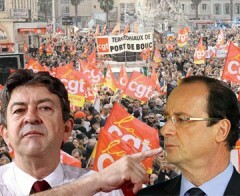 Austerity forever?’ Melenchon blasted. He criticised the President for inaction over an industrial meltdown highlighted by the controversial plans to close a Peugeot Citroen factory in an already depressed area. And the radical left MEP asked why a law – already tabled in parliament by the Left Front – that bans profit-making firms from making redundancies hadn’t been among the initial emergency measures enacted by the government. Hollande’s first hundred days in power have amounted to ‘almost nothing’, Melenchon concluded dismissively. Nervousness among socialist MPs and ministers over the President’s policies has been heightened over the hard line Hollande and his interior minister Manuel Valls have taken on the issue of crime and security, notably in response to a riot in the northern city of Amiens last week and the dismantling of Roma camps around French cities. Despite the message they delivered in the ballot box that they’d had enough of Sarko and his authoritarian austerity hawks, many in France may be concluding that Hollande’s new Socialist government is starting to look worrying like its predecessor. Privatisating benefits the public? – pull the other one!